Pale blue sky shows through the grey morning light, welcome after a night of wind and rain. I snapped this from my dining room at 10 am. The china hutch. I'm becoming fonder of plain white dishes, especially for serving pieces. But I'll always add a bit of colour - here it's blue, although you might notice a tiny band of red on the two oversized cups on the top shelf. They are a recent acquisition thanks to a birthday gift card. Soon I'll add greenery and a little more red - the holly berry bush is loaded this year. Most of the day was spent in the kitchen, baking. 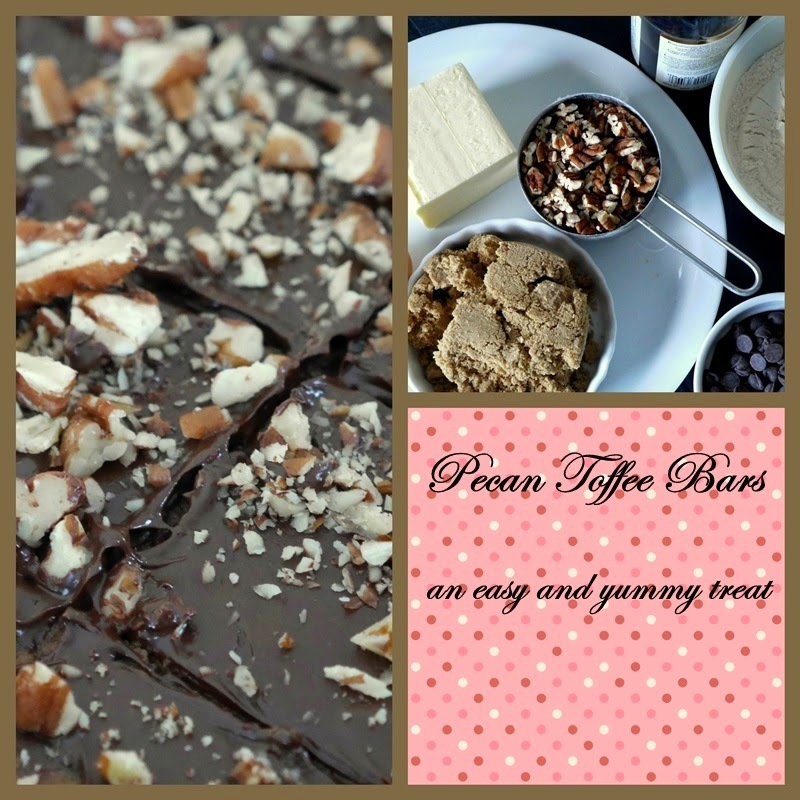 The Pecan Toffee Bar recipe can be found by clicking on the link. It will take you to my recipe blog. The baking is for an event with some of my husband's work colleagues. I offered to bring a tray of goodies so that's what I worked on today, not knowing if I'll be called in to work again next week - it's cold season and there's a doozy going around. I taught every day last week in the same classroom. How are you all faring? Escaping illness so far? I hope so. Tim and I have both had the current version of a cold and we're glad it's behind us. In this post, there is a calm and peaceful atmosphere that I enjoyed very much. Your china is very elegant... and the recipe looks wonderful! Pretty dishes arranged in your hutch. I love your new cups. I wonder what the writing says. Our holly bushes are not loaded with berries this year like they were last year. I wonder what that's about. Like Podso, I am curious about the script on the cups. Fortunately, all is well on the health front here. I imagine your goodies will go over very well! Oh dear! I forgot the pecans when shopping. That'll never do. This recipe looks so easy and delicious for a holiday treat. Yes, whatever the cold is this year, it's nasty. We were both sick for most of October, but it's past now unless I go out in bitter cold because then it triggers the cough again. Stay well...not always easy when around so many young people in close quarters. Those goodies look real good. So far so good for escaping illnesses. Something has been trying to get me but I'm happy I made it through our family Thanksgiving celebration healthy. I will certainly enjoy watching you and other bloggers bake their holiday treats this year. I will forgo the pleasure for the most part. I am working very hard to take off some pounds, so I dare not tempt myself. I do like your white dishes. I am getting used to them. I seem to like simpler things these days. The just will look very festive and pretty dressed for Christmas. We are healthy here. No flu shots. No colds. No flu. Fingers crossed. I can't wait to see your china hutch all decorated for Christmas. I think, being neutral, your china will provide a superb background for Christmas colors. Very pretty hutch, and I like your white dishes. I love toffee, that recipe looks really good. So far, we're all healthy, and thankful for that! I love white dishes,,,they are so easy to dress up! and you some really nice serving pieces in your display. Yummy looking recipe, and I have a craving for chocolate!! Have a great week. I love white China and silver pieces....there is something so elegant about those two when paired together to set a table. I love that white, with just enough splashes of colour. . . and yum, yum, to those pecan bars! 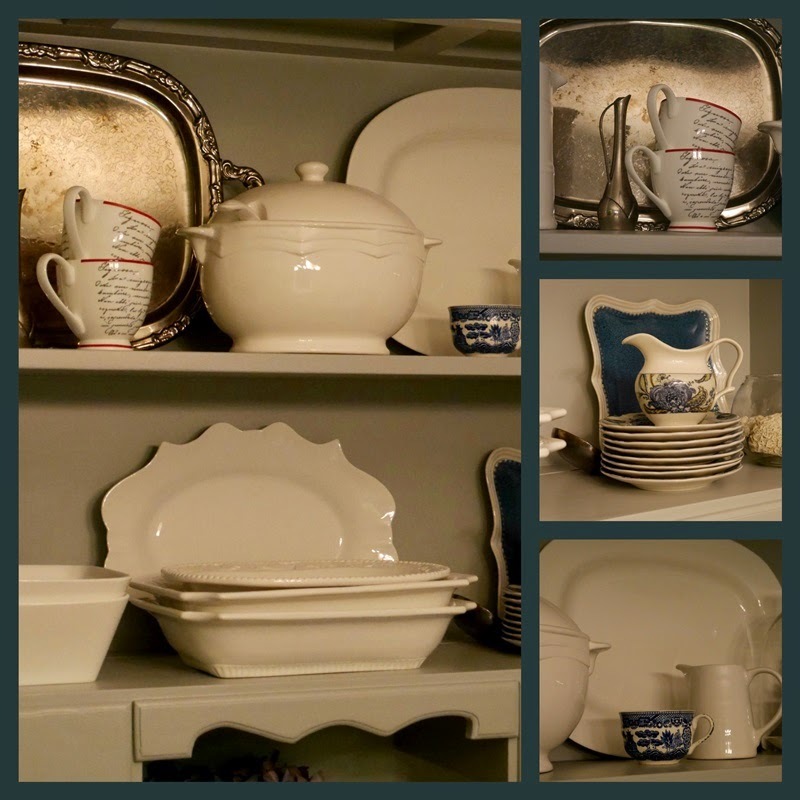 I am a big fan of white dishes...and yours look lovely in your hutch! I love that white dishes marry with any other color or occasion. Oh, my. The pecan toffee is making me salivate. Yum!! Glad your colds are behind you. Those Pecan Toffee bars are a family favorite - I will be making them soon for gifts and for snacking. I love your cupboard with the white dishes and a touch of color. We are using white china with raised vegetables on the rims of the plates and bowls - all in white. I'm using giant leaf place mats - they remind me of the Big Leaf Maples around here - and leaf print napkins. Then after Thanksgiving the christmas colors will come out. Your hutch is the ideal place to display your collection of white dishes, love the little blue and white touches here and there. Lucky you to have plenty of berries on your holly, ours is very sparse this year. Your toffee bars look scrumptious, Lorrie! Your china is very pretty. Thankfully I've been well. My grandsons were over today and both have colds, so I don't know if I'll catch that from them. Hope not! I had eye surgery a few weeks ago and am just beginning to feel normal again. I think we avoid a lot of the colds and flu that goes around as we live away from town. Just going in once a week to do laundry, get groceries, stop at the P.O. and library... and then back home again for another week. white plates are so versitile, but I do love the touches of colour too. Add oh my, those pecan bars look delicious! Stay warm and happy thanksgiving. All so pretty and calm. I might have to make pecan toffee bars this week; they look good. I love your white china in your hutch. It looks very pretty. The toffee bars look yummy and I'm going to check out the recipe now. I hope you don't catch any more colds. Beautiful sparkling white china pieces displayed on your hutch. The two cups look interesting Lorrie - a closer look next time maybe?! Am I being too nosey - just say! I feel the winter cold we all get now is no longer 'just a cold' it seems to have developed into something much more and is much harder to shake off. Thank goodness I got through this winter without any complications. Maybe our immune systems need building up before the onset of winter. Now I dread the long overseas flights because of the bugs one is subjected to... it's taken the fun out of flying for me! I like the ornately scalloped platter and you're right, white can go with everything and at any time of year. There has been a bit of flu around and colds but so far so good for us. A lovely way to spend a Saturday. The recipe looks yum-yum indeed. I love days where what's on the agenda unfolds in peaceful and unhurried pleasure. With the darkness settling in so much sooner and the cooler temps I am feeling very much like hibernating. A good book and hot mug of coffee and maybe a smidge of that yummy dessert you made. Love the white dishes! Hi Lorrie, We were really glad to see the sunshine today, too. It rained here ALL day and evening yesterday. Today it got up to 72 degrees here in North Carolina; can you believe that?! On Wednesday, our high is supposed to be only 40 degrees. I like your shelves of dishes; white dishes really are a classic and so nice to have. :) I'm going over to check out your pecan toffee bars right now. I'm sorry you've been sick, Lorrie, and hope you're feeling better very soon! I sure like your scripted cups! We are staying healthy and I've been so grateful for it!!! The cold was a month ago and it took forever to get past the cough. Hoping now to stay well through winter. I am loving the white plates too, my husband thinks they are boring. Oh pecan bars, yummmm! I am serving an afternoon tea on Dec 13th and pecan bars is on the menu. Pecan pie is on the menu for our Thanksgiving. Lovely view. - Pretty serving trays and may I have some of that Pecan Toffee Bark, Yum! Mmmmmm! What a yummy mosaic!